All sculptures must be able to traverse a ½ mile course with 7.5% grades, in less than 1 hour through the efforts of one to four individuals pushing or pulling. The course will be paved, but may include short stretches of lawn. All sources of power must be living organisms. (Dogs and children under 4 count as 1/2 a human. Users of non-human engines must provide a cleanup crew, and comply with any leash rules of the race venue.) People riding the sculpture, or “running” with the piece but not contributing to forward motion, don’t count as part of the engine. Rolling parts (such as wheels) or other devices making motive contact with the ground (one renowned racing sculpture had walking metal feet, and we all love Strandbeest), must be integral to the artistic work. Moving elements of the sculpture that don’t contribute to forward motion can be powered by any means not involving internal combustion engines, or open flames. The piece’s tentacles could be squirmed by electric motors, pneumatic cylinders, a 5 year old kid turning a crank, or magic spells. Any gears or belts, etc., that can be reached by an average sized 8 year old riding on, or standing next to the machine should have some sort of guard at any pinch points. The sculpture must be able to remain upright when left unattended.This means at least 3 points of contact if wheeled or legged. A parking brake is a good idea. If your machine will have a passenger, there should be some means taken to keep them on board (railings, etc.). A “leave only footprints” policy is in effect, blowing soap bubbles is a fine idea, glitter cannons are right out. Emitting fog (theatrical, or cryogenic) would be great. Sorry, no open flames. Anything that falls off must be carried to the finish line. Sculptures must be less than 8 feet in length, and 4 feet in width. Since the works will be moving at speed, and the audience may be at some distance, pieces should be substantial in size. Your piece must not fit inside a 2 foot cube. Sculptures must be able to manage a 100 degree turn on ordinary city streets with a 8′ lane width.The sculpture may come to a full stop, and even back up if needed. Some assistance by lifting and shoving is fine, disassembly is not. Building in multiple linked segments would be impressive looking. If the sculpture has a “front”, or can only be propelled in one direction it must be able to be turned completely around in a 30′ wide street. Some disassembly is fine, but it must be able to complete the turn in 5 minutes. Height is not limited, but the piece must have a way to fold to fit under a 9′ bridge. (So your obelisk will need to telescope or fold. )Folding should not require disassembly. Stopping while folding is permitted, but discouraged. There is no rule 8. Weight is limited to 500 lbs. per segment, and no more than 250 lb at any point of pavement contact. Since the course includes a steep climb, and there are only 4 people pulling, lighter is likely a good thing to keep in mind. Lighting (decorative and functional) is encouraged. The sculpture (or crew) making music, or even just random noise, is a great idea.The maximum volume should be no greater than 110db, measured at a distance of the piece’s width, from the midpoint of the machine.The musicians may “run” with the piece, or ride it. If they aren’t contributing to propulsion they don’t count toward the 12 engine limit. Amplification is permitted. You must secure appropriate performance rights for music played. Prerecorded music is not permitted. 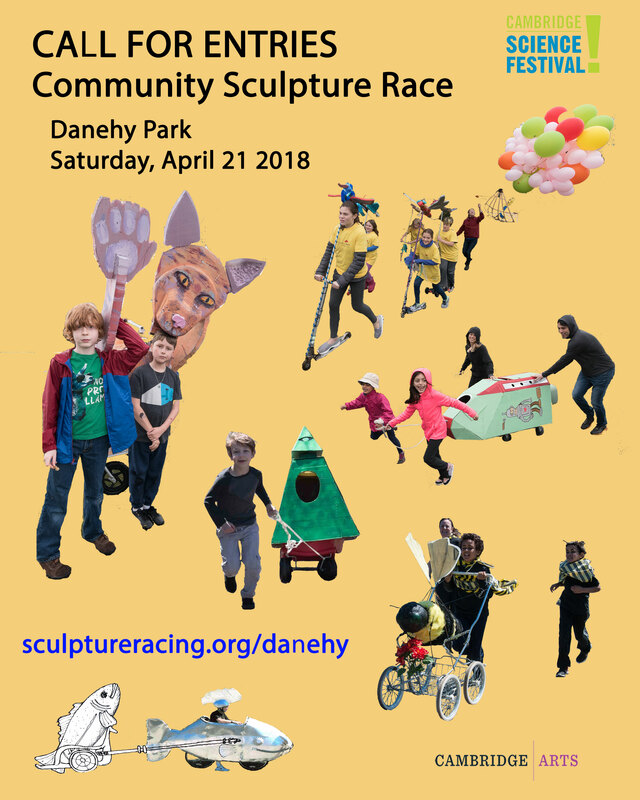 Costumes worn by the participants have the same size restrictions that apply to the sculptures.Costumes must comply with any “indecent exposure” laws in effect at the race venue.